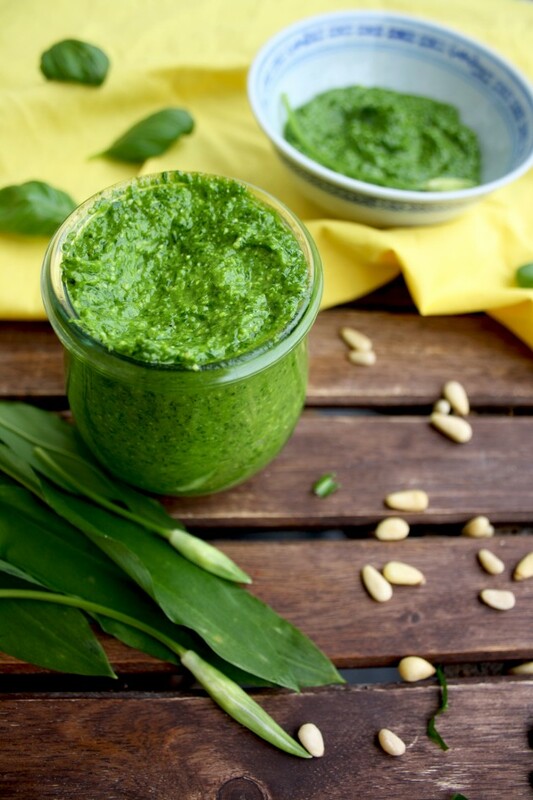 Vegan and raw Wild Garlic Pesto is a truly universal spring condiment. Perfect with pasta or as a bread spread, it goes well with all things savory. Vegetarian, gluten-free, low carb. 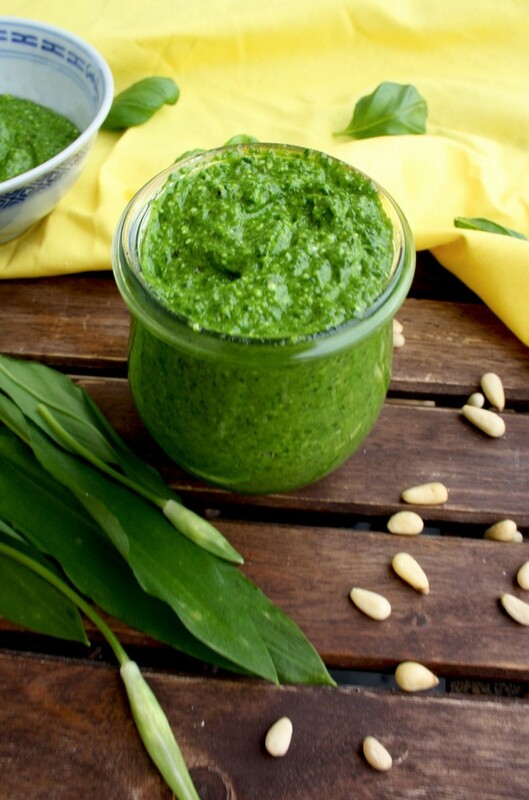 Wild garlic pesto is my go-to spring condiment, spread, dip and salad dressing. I bake it into bread, I spread it on my toast, I use it as a soup garnish, I drizzle it over roasted vegetables, scrambled eggs, pizza, pasta and pretty much all things savory. 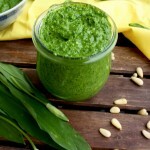 Wild garlic pesto is a truly universal condiment, just like kale pesto in winter and basil pesto in summer. 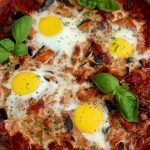 My life has changed since I discovered that there is so much more there than just classic basil pesto! OK, it can’t be called authentic any more, but who cares if it’s delicious? Here are some ideas: parsley, arugula, cilantro, garlic scapes, pea shoots, mint, thyme, sage, spinach, tarragon, Swiss chard, beet greens (basically any kind of seasonal greens), pumpkin seed, dried tomatoes, eggplant, zucchini, roasted bell peppers, beets, carrots, ricotta… Not mentioning different kind of nuts you can use instead of classic pine nuts: almonds, walnuts, cashews, pistachios, pecans, macadamia, hazelnuts, sunflower seeds, etc. 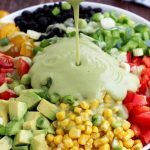 Use any combination of greens/roasted veggies and nuts, add some garlic, Parmesan or any other hard cheese (optional for vegans) and olive oil (try other kinds of oil like avocado, sunflower, pumpkin seed, walnut, sesame, almond, grapeseed and coconut). Your options are countless! 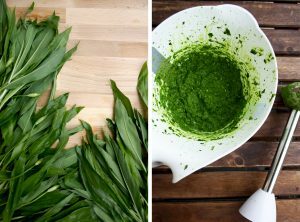 I like the idea of seasonal eating, so wild garlic sounds like a good choice for pesto in early April. We collected a lot of wild garlic in the forest next to our house, so I made creamy wild garlic soup and pesto from it. I also froze some for later and use it as a garnish, for example for beetroot risotto, pasta or salads. 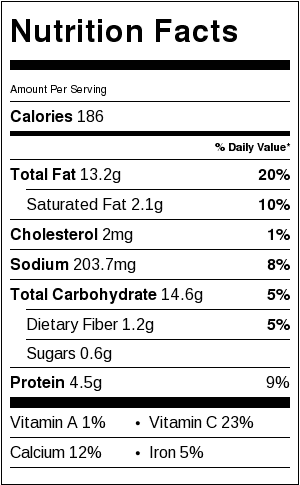 If you are interested in seasonal cooking, I’d like to introduce you to a new mind-blowing concept called the New Nordic Diet. I just finished a free online course from the University of Copenhagen on Coursera, introducing some principles and ideas behind this concept. In a nutshell, it’s a modified version of clean eating. The main idea is to eat whole, seasonal, locally-grown food, using the potential of the resources around you: forest, sea, lakes and rivers. In case of Denmark, the diet would be based around whole-grain rye bread, root vegetables, wild plants and herbs, berries, new types of vinegar, wild game, fresh fish and seaweed. The first restaurant to popularize this type of menu was the famous two Michelin star Noma in Copenhagen, opened in 2005. The menu of Noma is based on a diet, rich in Scandinavian foods, seasonal yet vibrant, traditional yet creative, and most importantly healthy yet sustainable, due to the use of regional and minimally processed ingredients, rich in vitamins, protein and fiber. The concept of the New Nordic Diet is much wider than that, though. This type of diet was successfully implemented in the restaurant Gustu in La Paz, opened by the celebrity chef Claus Meyer of the Danish Noma. Gustu serves traditional Bolivian inspired dishes, made of seasonal and regional ingredients but prepared in a new way. You can compare this type of diet to the Mediterranean diet, which is claimed to be generally healthy. Whereas the idea behind the New Nordic diet is to find out which foods suits best YOUR climate. Eating seasonal and locally-grow food is a good choice to make in terms of fighting climate change. 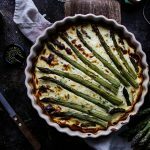 I put together an article on Mode about foods that contribute the most to global warming, which I’m trying to avoid at the moment. Nothing new, meat, non-organic fruits, vegetables, grains and processed foods. An example of new Nordic food can be my wild garlic pesto. 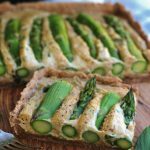 I live in the Nordic region, where wild garlic is in season at the moment. 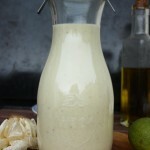 I use locally-grown pine nuts and garlic, locally produced Parmesan-like cheese (which is therefore not to be called Parmesan, but how to call it then?) and walnut oil. 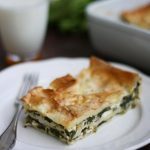 It’s an example of how you can alter ingredients of your favorite dishes to better suit your climate. Be inspired by the traditional food and ingredients of your region. 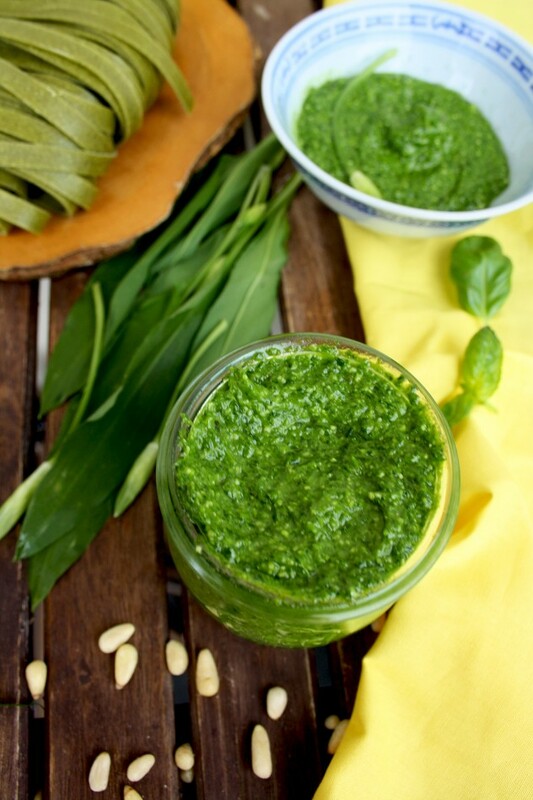 Check the recipe for my wild garlic pesto below and feel free to alter greens, nuts and oil according to what’s in season in your region right now! Using a food processor (I use Philips Avance Collection Blender) or an immersion blender, pulse chopped wild garlic with stems, toasted pine nuts, garlic, Parmesan cheese (if using) and lemon juice until smooth. Gradually add walnut oil until you like the consistency. Add more oil to adjust the consistency. Season wit salt and black pepper. 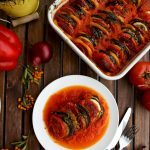 Serve with pasta, bread, salads, sandwiches, potatoes, roasted or fresh vegetables, eggs, fish, soups, beans or anything else you like. Enjoy! If you want to preserve it, just boil your jars in water for 15 minutes, cool them, pour the green sauce and a tablespoon of olive oil on top. That way you can store it in the fridge for a few weeks. If you want to store it longer, simply freeze it. 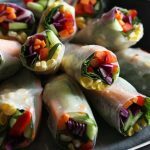 Tried this recipe?Follow @happykitchen.rocks on Instagram and show me the recipes you are making from my blog using the hashtag #happykitchenrocks! 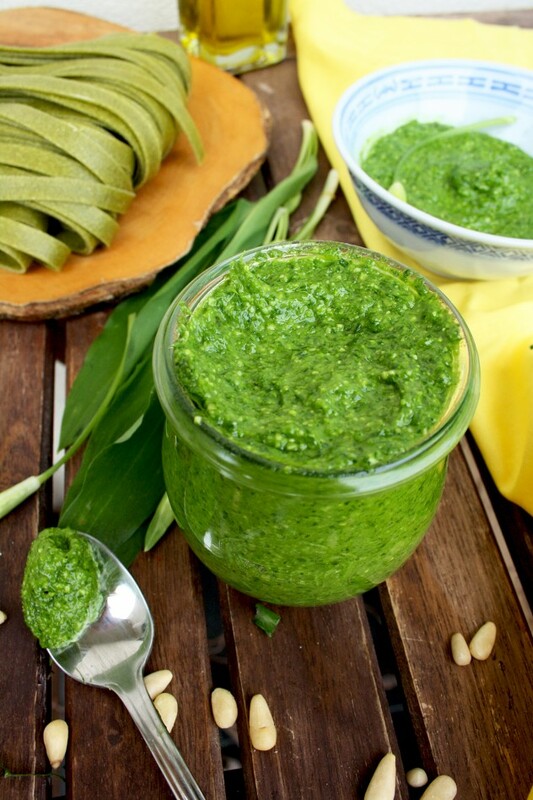 What is your favorite pesto? Leave a comment below! 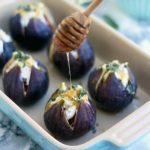 Elena Szeliga is the founder of Happy Kitchen.Rocks, where she shares delicious and healthy vegetarian and vegan food, from weeknight dinners to veganized classics and gourmet appetizers. 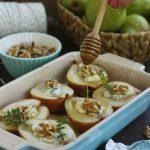 Her recipes have been featured at Better Homes & Gardens, BuzzFeed, Country Living, The Kitchn and Reader’s Digest. 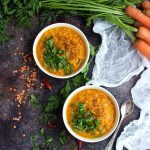 Her mission is to help cook easy vegetarian and vegan meals with simple and fresh ingredients. Read more about Elena. I love that your garlic pesto has soo many uses! Its versatility is amazing and I may have to save this recipe for future use. Thanks for sharing this. I’m so glad you like my recipe, David! Welcome to my happy kitchen! I’m so happy you stopped by. 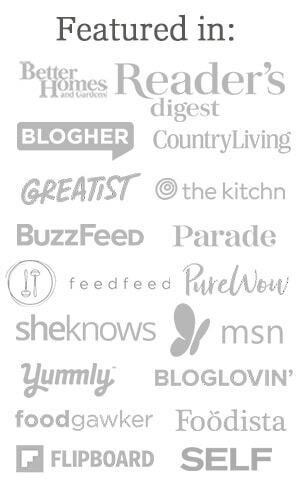 I’m Elena, a blogger behind Happy Kitchen.Rocks. 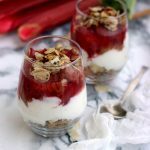 I post delicious and healthy vegetarian and vegan recipes that are easy to make. Dig in! Subscribe and receive my free E-Book!